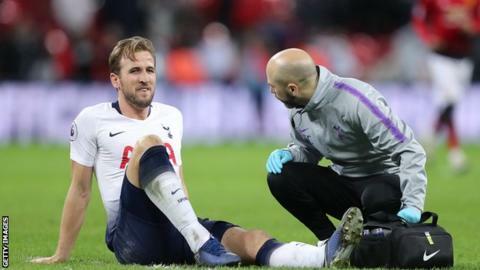 Tottenham striker Harry Kane will be out until March after injuring ankle ligaments in Sunday’s 1-0 Premier League defeat by Manchester United. Spurs say the England captain, 25, will return to training in early March. Kane, Tottenham’s top scorer this season with 20 goals, is likely to miss both legs of the Champions League last-16 tie with Borussia Dortmund. He will also be unavailable for the second leg of the Carabao Cup semi-final against Chelsea on 24 January. Kane injured his left ankle when he was caught between United’s Phil Jones and Victor Lindelof late in the game at Wembley. Spurs, who are third in the Premier League – nine points behind leaders Liverpool – look set to be without Kane for the games against Chelsea and Arsenal on 27 February and 2 March respectively. Tottenham forward Son Heung-min is currently on international duty with South Korea at the Asia Cup in the United Arab Emirates. Son, who has scored 12 goals, could be unavailable until February depending on how far South Korea progress. The final is on 1 February. France midfielder Moussa Sissoko was replaced in the first half against United with what appeared to be a hamstring injury. Tottenham’s back-up strikers are Fernando Llorente, who has scored four goals in 13 appearances this season, and Vincent Janssen, who has not played for the first team since August 2017. England face the Czech Republic on 22 March and Montenegro on 25 March in Euro 2020 qualifiers. How big a miss will Kane and Son be? Since Pochettino became Spurs manager, Kane has scored a league-high 119 Premier League goals, accounting for 36% of Tottenham’s total of 333 in that time .